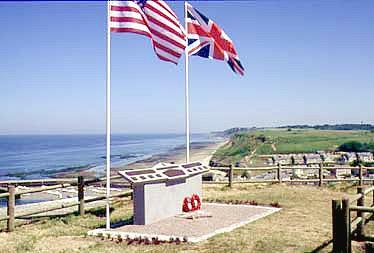 Port En Bessin is situated between the two D-Day landing beaches: Omaha and Gold. This village was liberated on the morning of June 8th 1944 by British Commandos, linking up with American troops from the 29th Division. There are a number of monuments that pay homage to these brave men and they can be found dotted around the harbour area. The formidable German battery At Longues Sur Mer is only a 10 minute drive from Port En Bessin. There are a number of good quality restaurants and shops located around the harbour area of Port En Bessin. For those who are looking to eat something simpler, then there is a great little take away that offers sandwich et frites, burgers and other convenience foods. For those with a healthy appetite, we recommend the sandwich Americain (steak baguette and fries). This is a quaint village to take a promanade in the evening, strolling around the harbour and up into the surrounding hills. This is a working fishing harbour and during the day it can be a hive of activity with fishing boats delivering there catch; some going straight to the local restaurants. In the high season there are a few small amusement rides for younger children. We have spent many of night here with our kids watching them on the merry-go-rounds; our young children certainly enjoy it here. 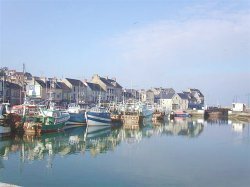 We would heartily recommend stopping off at Port En Bessin and taking a small walk around the harbour area. We have tended to do so in the evening before heading for home; tired kids in tow!